Where are you going to be on Saturday January 5, 2008 at 2pm? If you said at Foster's Urban Homewares at 399 Market Street enjoying Fork You Live, well then you're correct! That's right, for some odd reason Foster's has agree to let us tape a show at their fine establishment, and hold a cooking class at the same time. Join us to learn how to make your salads sassy and laugh while you do it! I'm totally stealing this idea from Steve Garfield (you can check out his favorite photos on his blog). I give you my favorite photos of 2007 (I didn't take all of these, but they were all taken with my cameras so I think they count!). Oh, and you might not be able to see the above slideshow in your newsreader of choice, so visit the actual entry to see it! I like Rudy Giuliani. There, I said it. I know lots of people don't like him, but I lived in NY when he was mayor and the city changed visibilty. He did a great job as mayor (though I'm not so sure he would make an equally good President) but I completely disagree with this. No matter what the situation torture is never OK as a state sponsored activity. It is a slippery slope, and down right un-American. That's just my opinion (though I am right). Lots of stuff is going on in my life at the moment (check this out for a taste, I'll write more about that later), but I wanted to point out that I was on NPR this morning for a few seconds. Cyrus Farivar spoke to me about Malware on OS X for the technology segment of Morning Edition. For a long time I was embarrassed by my waist size. I thought that if people knew how big I was they would think differently of me or something. Obviously that makes little sense since just by looking at me you can see I'm a big dude (and I was much bigger not too long ago) so if someone were to think poorly of me due to my size they needn't know my actual waist size. Yesterday, after posting this tweet, I realized I am no longer embarrassed by my waist size. Sure, a 42 waist is still too big and I'm working on it. That said it is just a number that means the pants I buy will fit me. A little over a year ago that number was 50 (and those was a little snug on me) so, I think I've done a pretty good job. An upside to now wearing a 42 is that I can pretty much walk into any store and buy a pair of pants, other than the Gap that is. You see, yesterday I had a khaki emergency. For many, many years the only pants that I wore were khakis, and so I figured I would have a pair of khakis to wear Friday evening without even checking my closet. Fast forward to Thursday night and to my horror I discovered that as my waistline dropped I had adopted jeans as my new pant of choice. I had one pair of khakis which weren't the right color! Which is why I found myself in the Gap looking at their pants after lunch on Friday. Now, the Gap.com sells pants in many extended sizes, so I thought there was a chance that the stores carried them as well. Sadly, it would seem that physical stores only stock pants up to a 38 (well, at least the one I was in). I did buy some cool socks though. It all worked out though, since not being able to find pants in the Gap meant I went to Mac'ys and got some pants that are much nicer than anything the Gap sells (though they also cost twice as much). The moral of the story? Always check your pants before you make plans. See my 2006, and 2005 versions (for some reason I didn't blog the 2007 edition). This weekend I found myself in Connecticut visiting my dear old friend Glenn (it is hard to believe that we have been friends for over 16 years now... where does all the time go?) and a good time was had by all. Glenn, as of late, has been getting into guns. You know, going to the firing range and squeezing off a few rounds. As such, he has a new rifle that he needed to get fixed which is how I found myself in a gun shop for the first time ever. The gun shop was kind of neat, since I do think guns are interesting as artifacts (I would never own one myself, but it was an antique or something) but it wasn't anything too exciting (though I did meet a nice doggie). The real fun began after the gun shop, as it often does. We went on a little adventure to see the Cabela's that recently opened up shop in CT. 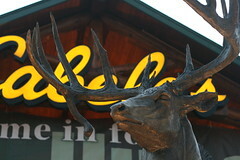 If you don't know what Cabela's is, you are not alone. I wouldn't have known what it was either, but I had attended a talk by someone who helped with the website so I was hip to the Cabela's. It is a sort of outdoorsy apparel/accessories super store... and when I say super store I mean super store. This place is HUGE. Take a look at the pictures I took (some people thought it was odd that I was snapping so many pictures, but who cares!). One of the coolest things, though, was the restaurant which serves all kinds of exotic meats. I was in the sandwich line, looking at the line up of elk, bison, and ostrich trying to decide what to get (I went with the ostrich) but I was shocked when the 4 people ahead of me all ordered tuna salad! I mean, come on people, live a little. Anyway, I have to grab my Jerky Blaster and some Buck Lickers and get out of here. I'm not a graphic designer (I can hardly dress myself, which is very evident when I hang out with Philly's creative types. They all look together, and I look like... well, like me) but I know when I like things. The logo for the NY Time's blog Jet Lagged is awesome. I really, really like it. Fork You doesn't really have a logo as of yet, but I would like our logo to be in the same spirit as this one (though with less planes in it, probably). 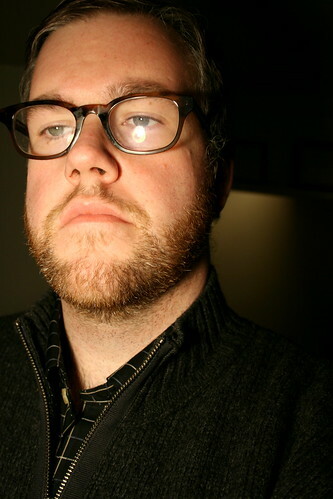 I may not be 'sporty,' but I am damned photogenic. Am I right, ladies (and 10% of the dudes)? I thought so. Anywho, this winter found me, as most winters do, gloveless. I did buy some gloves last year but damned if I know where they are. Since would seem that winter has stuck here in Philly it was time to protect my precious hands (hey, I make my living using my hands so they are important to me). Off to the local EMS I went in search of gloves, and gloves only. It is interesting to note that since I have lost 100 pounds over the last year I've going from a 4XL to a XXL. That, in and of itself, is worthy of pointing out (as often as possible) but there is a greater meaning to that: I can now pretty much buy clothes in any old 'normal' store. Most stores stock sizes S to 2XL as a matter of course (and I am only talking about men's clothes here. Thank goodness I'm not a cross-dresser. I have no idea what the hell women's clothes size mean.. but I like to image that I'm a size 0) and up to waist size 40 (42s can be found in most cases but 40 is pretty much the upper limit that I have encountered. Sadly, I'm a 42 waist, which is down from an all time high of 50). Since I fit into 2XL shirts/sweaters/coats now I often find myself looking around at clothes when I enter a store like EMS. I quickly found some gloves that I liked and then wondered over to the sweaters. I'm a sweater guy. For some reason, the sweaters, they talk to me (though not literally because that would be crazy). One sweater caught my eye: the EMS Heritage Sweater. I figured they wouldn't have my size, but I pawed through the stack and found a XXL. It was a bit pricey, but you only live once so I picked it up and when to check out. Imagine my surprise when I found out that the sweater was on sale! Uncle Scottycakes scores! Above you see me in my new sweater staring into a lamp. I'm so attractive I could puke. I've been told by a number of people that I need a haircut. FINE! I'm getting a haircut at 9am on Friday morning at American Male (I chronicled my first visit to American Male a long while ago. And yes, I'm getting the 'Quality Grooming Experience,' which includes a paraffin hand dip (so nice!) and 2 shampoos (I fully intend to get both, damn it!). Thanks to Roz, I am now a happy Hulu user! Hurrah! That means I can watch this Big Brawn ad over and over again.